[.2]Change.GUI: Updated Serbian, Polish, Italian. [.9]Fix.GUI: Fix classification of multimedia process via process context menu. [.22]Fix.All: Adjustments to help avoid intrusion detection of some security software. These protected processes can not be listed due to their sensitivity to being touched, which is enforced via API hooks, causing CPU cycles to appear to be consumed by Process Lasso when the 'intrusion' events are logged. [.27]Fix.GUI: Fixed failure in unchecking process watchdog rules via the context menu. [.29]Fix.All: New syntax testing tools allow for identification of possible anomalies and crashes due to improper translations, several errors were fixed in some languages. [.30]Update.rcTools: Updated test batch file that invokes test tool. New Batch file provide by our Polish translator (gtweak). This build was a day or two behind my scheduled release date, but such is life. The important thing is that we are rolling forward quickly now. This is the v5.1 'base' for any future maintenance, and the v5.2 beta series has *already begun*. We can't wait to show you what is in store, and will continue back-porting minor fixes to v5.1 while v5.2 is in beta. [.36]Fix.Core: Fixed issue where recognition of a change to a multimedia classification wouldn't take effect until the core engine, or the designated multimedia classified process, would start or restart. If using Energy Saver with multimedia exclusions, this could cause it to not behave correctly until the core engine (or applicable multimedia process) restarted after the configuration change. This build fixes an anomaly in some low-level code that was missed in the previous final. An embarrassing mistake and QA failure on this end, though it only affected those using Watchdog rules, which is likely why it was missed in beta testing. This build improves the white theme, amongst other minor fixes and adjustments. This build has some usual maintenance along with a new 'always right edition' installation (downloads correct installer if incorrect one was downloaded, in all cases). [.56]Fix.Installer: Added new safety to prevent a certain error condition (crash) seen in user reports. Secondary safeties added to apps for Portable Edition. [.58]Change.Installer: Made self-correcting installer have a YES/NO/CANCEL option when wrong edition detected. NO will continue the current install, regardless of the system detected. This is for cases that fall outside the norm, for whatever reason. CANCEL will abort the install. This version backports several fixes from the current v6 beta in internal development. You'll find it a superior build to the last. This build had one false start, that's how we got to .66. Fixing things up within a few hours, .66 is the final build. This build backports beter handling of processes that are actually services by both the governor and GUI. 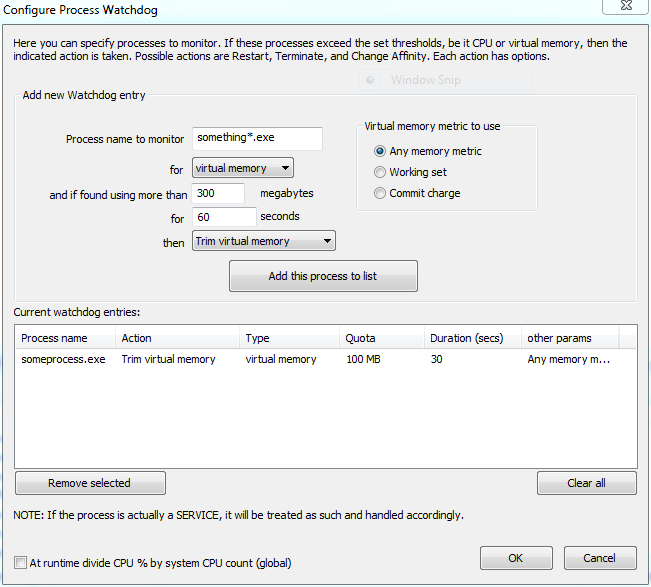 It also adds 'Trim Virtual Memory' as a watchdog option, though currently only available in the Process Watchdog configuration dialog. [.64]These are more backports from the new v6 code base. Specifically, it backports better internal support when dealing with services. This version back-ports new core-engine (governor) monitoring code to keep a continual watch on the governor. Best of all, it stays asleep until a problem occurs. Only then is it awoiken. If any problem occurs, it waits a bit to make sure it isn't temporary, then goes on to correct things (regardless of configuration). There are also a few other minor backports and optimizations from v6. This version back-ports more minor fixes and enhancements from the v6 alpha (internal) build. We don't want to make anyone feel as if they are waiting, and so are therefore making every safe enhancement available for v5. Keep in mind that anyone who purchases Process Lasso Pro at this time *will* get a free update to version 6. Fix.Core: Fixed Energy Saver could cause power profile to stay lowered if the core engine improperly terminated or if a shutdown was induced without user interraction. Change.Core: Allow wildcards in the watchdog ruleset. Change.Core: Updated to latest data structures from v6. Change.Build: Updated to latest PE Suite tools from Bitsum. Fix.GUI: Reduced minimum allowed remembered window size, as part of a gradual reduction. Fix.GUI: Change explicit shutdown order to eliminate error message box seen in some 2K/XP shutdowns. Fix.GUI: Fix an interoperability issue with some (a specific) security software. Fix.Updater: For licensed users, reduced extraneous UAC elevation prompts on 'automated' update when license is valided (changed completely in v6). Fix.GUI: Fixed a few lost translated strings due to the v5 and v6 branches co-existing (an issue now resolved forever). Fix.GUI: Further adjusted shutdown ordering and governor recovery mechanism, as some users still had complaints in 2K/XP under rare conditions. Fix.GUI: Added English placeholders for some untranslated Russian strings. Change.GUI: Improved localization of automated update dialog that is shown briefly, though this won't be seen until the next update. Change.GUI: Misc small tweaks, fixes, and adjustments..